The Aquamarine is the birthstone for March, this gorgeous gemstone is most commonly found in array of bright and crisp pale blue and aqua hues. 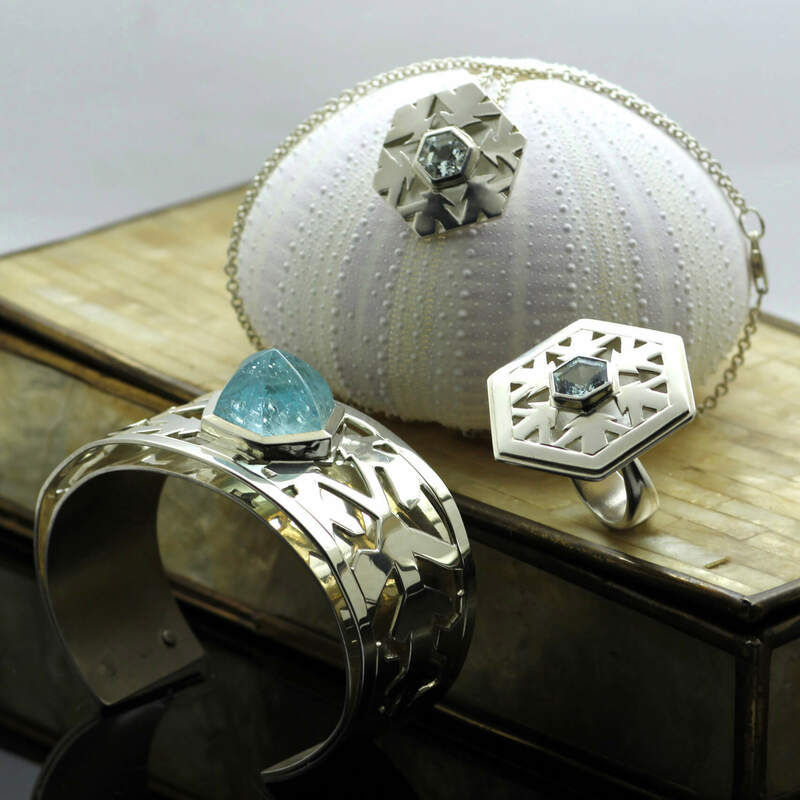 Aquamarine is a perfect source of inspiration for Brighton Goldsmith and contemporary Jewellery designer Julian Stephens to create some stunning modern jewellery, using this wonderful stone in a glorious array of different cuts, clarity and sizes as a starting point for his design process. Pictured is a veritable treasure box featuring some beautiful examples of Julian Stephen’s Aquamarine Jewellery which is from a recent collection inspired by fine engraving and filigree work found on an Antique Music Box. These stunning cut away designs create light and shadow, enhancing the soft shimmers and beautiful facets of each Aquamarine stone. The Aquamarine gemstones used showcase the wide range of custom cuts found within Julian’s Aquamarine gemstone collection and each precious stone is hand-set by Julian to create a powerful and modern geometric look which is inspired by the beautiful, unique symmetry found in snowflakes. To view more original, modern Aquamarine Jewellery head to our Vivaldi Capsule Collection page to enjoy Julian’s very latest imaginative and special gemstone creations. Aquamarine is commonly found in cavities, granite pegmatite, alluvial deposits of gravel and sometimes stream gravels. Aquamarine crystals are often discovered naturally formed in huge lump quantities, for example discoveries of Aquamarine as large as 3 feet tall are not uncommon with the largest single source of Aquamarine (discovered in 1910) weighing in at 243 pounds! The seawater color of aquamarine has given this gemstone its name as the name “aquamarine” is derived from the Latin word for seawater. 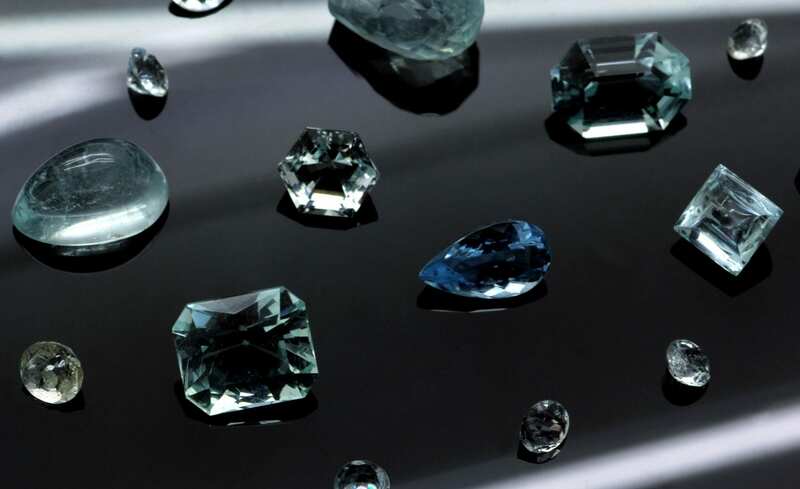 The specific term “aquamarine” was apparently used in an important gemological work by Anselmus de Boodt in his Gemmarum et Lapidum Historiia,” published in 1609. Within Folklore Aquamarine was referred to as a Mermaids treasure due to the stunning array of sea-like colours the Aquamarine evokes. Due to this close connection to the various tones and hues found within large bodies of water Aquamarine stones were often worn as lucky talismans by sailors and seafarers alike to ensure safe voyages across the seas. Aside from these fabled protective powers found in much European mythology the Aquamarine stone appears throughout Ancient History. Beads of Aquamarine have been found in Egyptian mummy-pits, and the Greeks used Aquamarine for intaglios more than two thousand years ago.